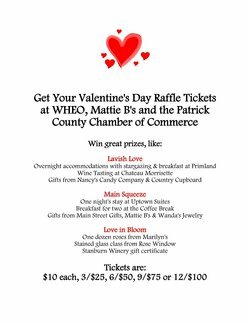 Get Your WHEO Valentine's Day Raffle Tickets!!!! Get Your WHEO Valentine's Day Raffle Tickets. The Patrick County Chamber of Commerce has tickets available for purchase. Tickets are: $10 each, 3/$25, 6/$50, 9/$75 or 12/$100. Win great prizes!!!!! See flyer for prize details.